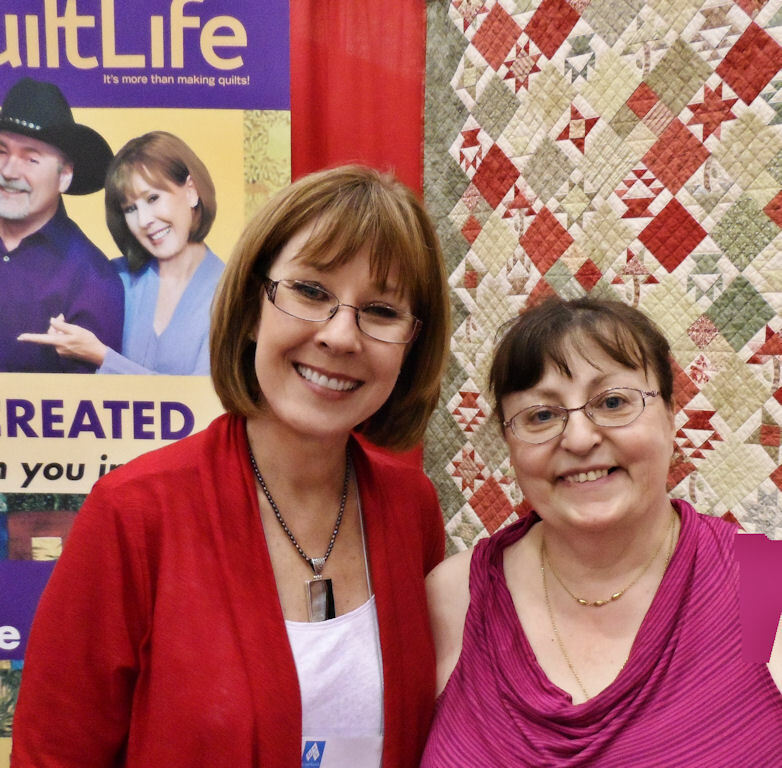 My favorite quilt MUGGLES, who know very little about quilting but chauffeured me around town to the show. 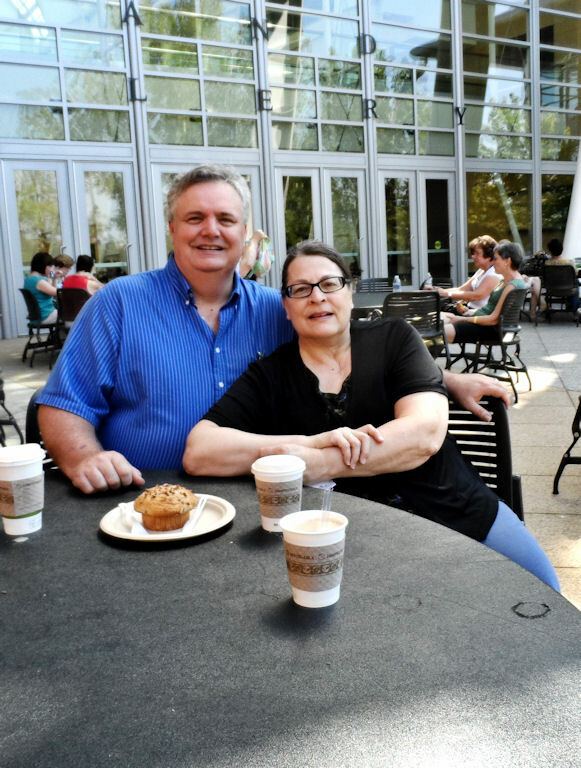 This is my sister Linda and her husband David. This may be the last picture you see of my on the internet, but I was so happy to get to talk to Alex Anderson at the AQS- Grand Rapids. 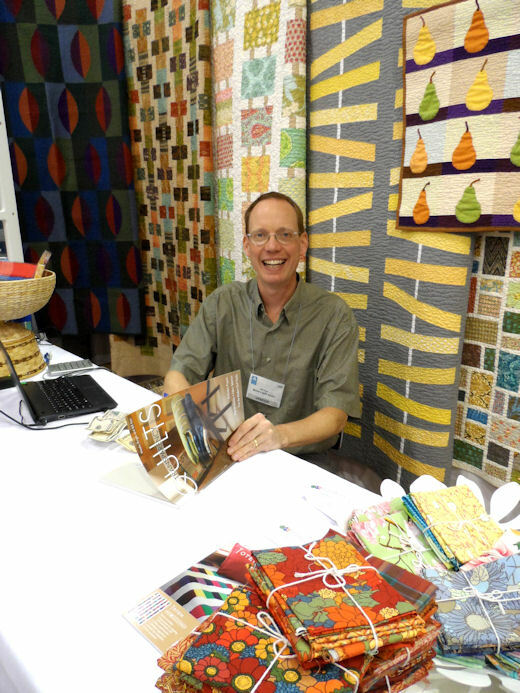 Met BILL KERR from Modern Quilt Studio. Got his picture when he signed my new book, Transparency Quilts. The panel is pinned on a bedroom door but it is crooked. I also noted there is a problem with the borders not laying flat. I do think once the dowels are in the place it will look better. I am not sure why the quilt does not lay flat as it was squared up. I think it might be the way the the binding was applied. I tried a new technique and I do not think I was successful. This is a picture of the top of the panel. I did some thread painting on the top border using techniques taught by PATSY THOMPSON. I have all of her DVDs and took a class from here a couple of weeks ago. I learned a lot from her, but that is a future blog and podcast. 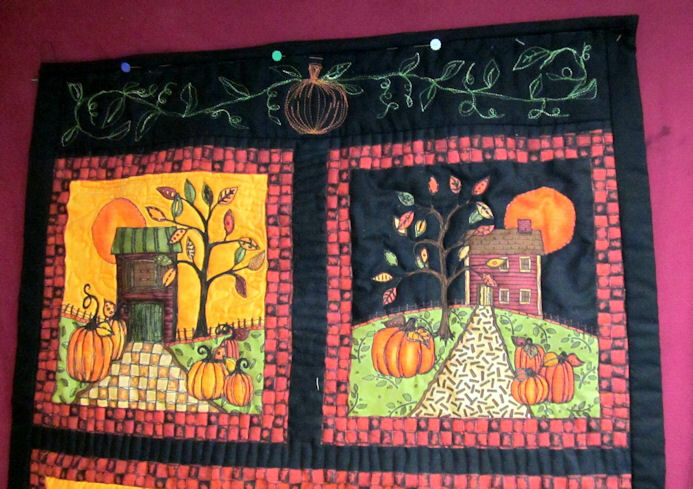 This is the center panel of the quilt. It is actually where I started quilting. 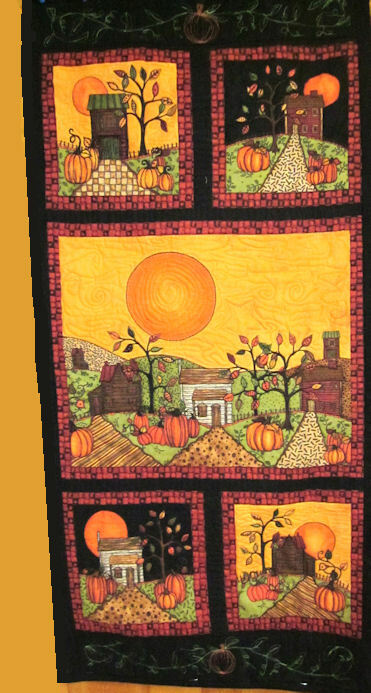 To me it seems backwards to me to start at the center of quilt when you are just learning how to quilt, because that is where MY worse quilting is. I repeated the thread painting motif that is on the top of the quilt. Initially I actually FMQed the motif in black thread on the black border. 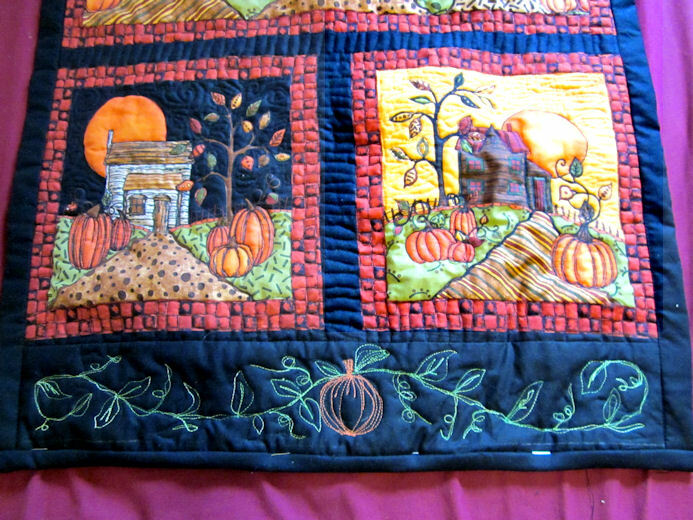 I later quilted over that FMQ in green and orange thread which actually showed up. 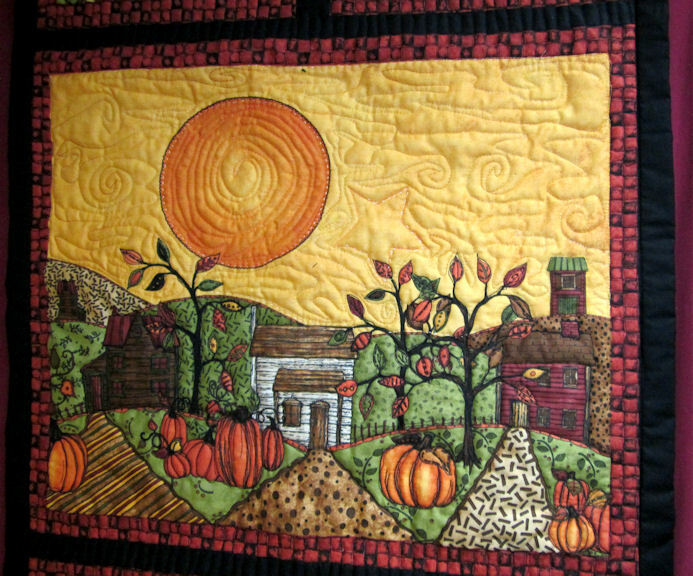 I did this because I knew I needed some quilting on the border but I did not feel confident in my quilting. After I did the initial black quilting I decided I was being a coward and requilted using colored thread you can see. It actually came out pretty good and I will be doing more of it in the future. I will be posting more information about my workshop with PATSY THOMPSON in the future. SO STAY TUNED.